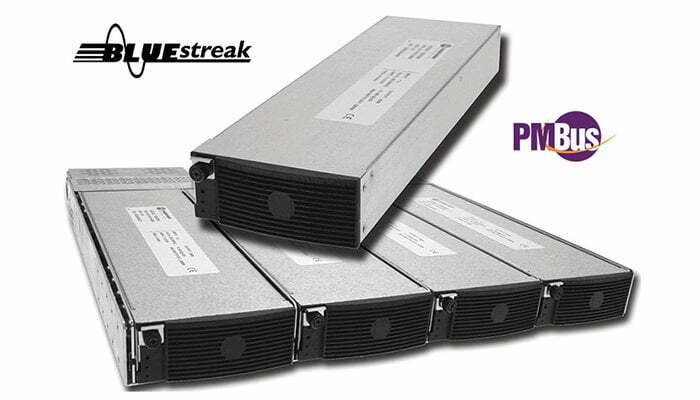 The BLUEstreak TBSR5000 is a hot-swap, modular 1440 Watt 24 Volt AC-DC Front-End. The TBSR5000 1440 Watt 24 Volt AC-DC Front-End is ultra-compact with a power density of 24 Watts per cubic inch. The TBSR5000 1440 Watt 24 Volt AC-DC Front-End output voltage can be controlled by 0V to +5V analog input. Green LEDs indicate AC and DC power good. The TBSR5000 1440 Watt 24 Volt AC-DC Front-End also has control and monitoring features and a +5V & 1.8A and +12V @ 0.8A standby outputs. Operating temperature range is -20°C to +70°C.